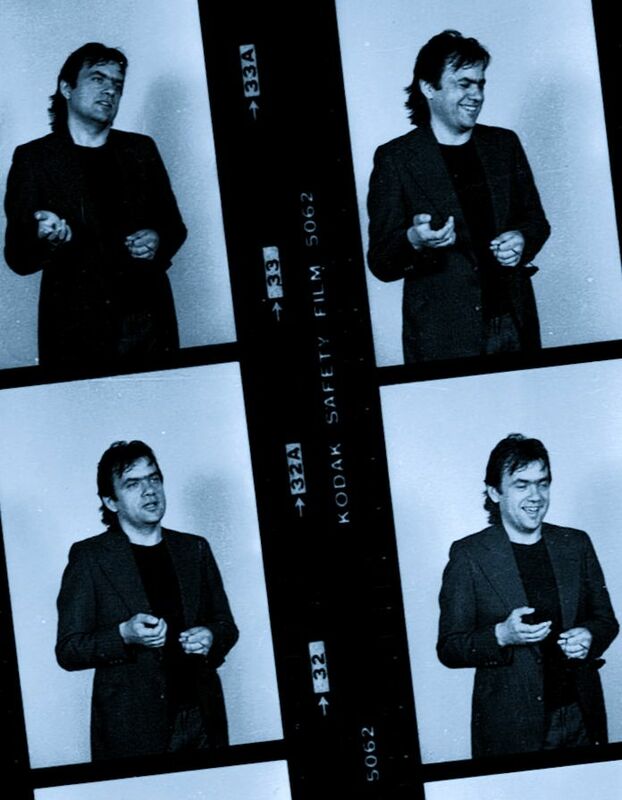 From the time British poet/ musician/ filmmaker Steve Scott arrived at St. Marks in the Bowery with a plastic bag full of poems, he has been playing havoc with the three Ps of poetry, prose, and performance, combining them in new and startling ways. A graduate of Croydon College of Art, he has written and performed widely in the UK, where his multimedia film, Correspondences, was selected for London’s “Expanded Cinema” festival. Stateside, he's best known for his mid- '80s rock record, Love in the Western World, on the indie Exit label. Appearing without fanfare, this auspicious debut floored fans and sent usually verbose critics searching for superlatives. 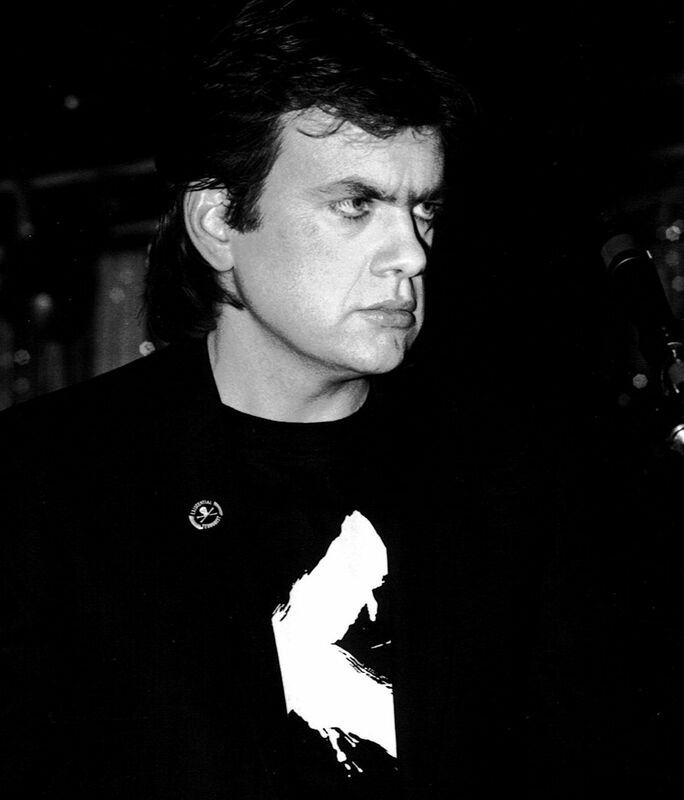 Steven Soles of the Alpha Band was the producer, with the post-punk 77s fueling Scott's literate mix of humor and insight, exactly on target for the era's new-wave sensibilities. 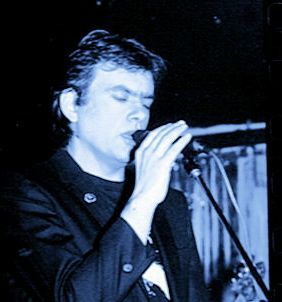 For "This Sad Music", the album's showpiece, Scott juxtaposed a televangelist with a newscast of dying whales, intoning the resulting lyrical collision over the 77s' minimal soundbed. His next foray found him reciting poetry over tape loops of ambient music on The Butterfly Effect. 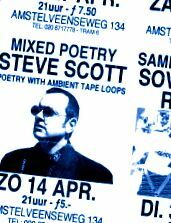 The album’s twelve minute plus opus, “No Memory of You” came courtesy of The Boundaries, Scott’s ongoing series of travelog/ poetry journals which have continued to spill back and forth between print and performance. Empty Orchestra, the literal meaning of “Karaoke”, was an instrumental CD, with lyrics printed inside so that the listener could be “Steve Scott for a day” by reading along to the music. Scott returned to museum installations in the late ‘90s to stage Crossing the Boundaries, a traveling exhibit with painter Gaylen Stewart which toured worldwide from the US to China. He currently heads CANA, an international arts group which has held conferences in Asia and Eastern Europe, from Bali to Bulgaria. He writes and lectures often on the arts in the US and UK, and is the author of two books, Crying for a Vision and Other Essays, and Like a House on Fire: Renewal of the Arts in a Postmodern Culture. He holds an M.A. in Global Leadership. Crying for a Vision, a collection of essays concerned with arriving at a truly Biblical approach to art, lays out for the reader precisely why (Steve Scott's) art has always been so strong.... His suggestions for basic principles of artistry, based upon a nuanced and comprehensive grasp of scriptural passages, are profound and deeply Biblical. If you are an artist (or a pastor), or are simply interested in art, it is imperative, for the good of the Church, that you read and digest this book." -Kemper Crabb -HM magazine. Kemper Crabb has played in Caedmon's Call, ArkAngel, Redemption, and Atomic Opera. His albums include The Vigil, Live at Cornerstone 2000, A Medieval Christmas, and Flotsam and Jetsam. -CCM Magazine Sept. 2007, p. 15. Chris Well is the author of the comic mystery novels, Forgiving Solomon Long, Deliver Us from Evelyn, and Tribulation House. 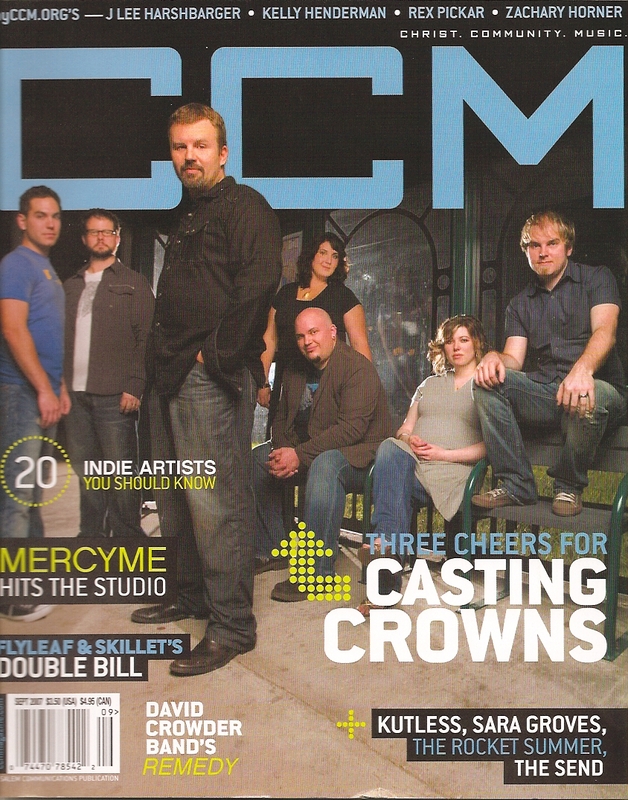 May 2008 was the last print edition of CCM, which continues as an online magazine at ccmmagazine.com. 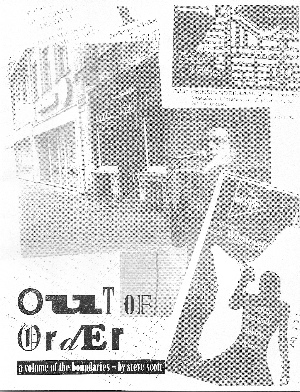 The magazine, which began in July of 1978, celebrated three decades as a print magazine. Subscribers were offered the option of receiving HM, beginning with issue no. 132, July/ Aug. 2008. 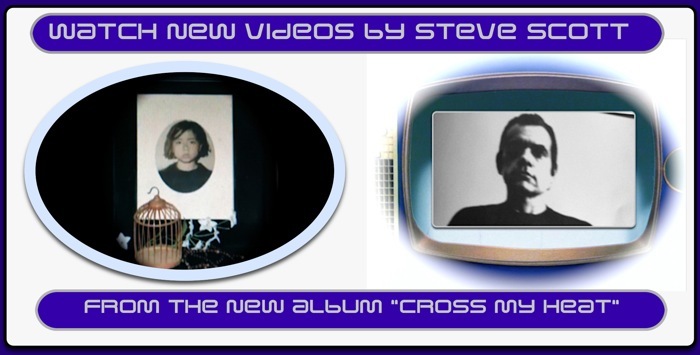 "Author, poet, and musician Steve Scott shares his thought-provoking views on the Bible and art in Crying for a Vision and Other Essays. Yes, a must-read." -Chris Well. "needed in our post-grunge world." "The Permanent Things in a Bookcase"
"Who would have expected a rock-n-roller to have much to say about religion and the arts? Steve Scott has a message, and he delivers it well. The primary audience for this book is the Christian artist. 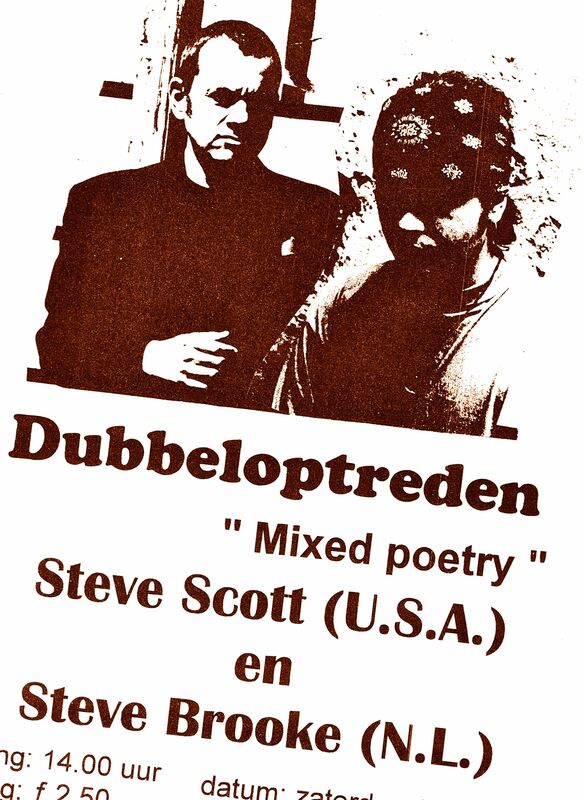 That said, I am Christian but not an artist (at least not in the traditional sense); I work as a software engineer; but maybe I am a poet at heart: because Steve Scott’s book nudged at my heart and mind. His book needs to be widely read. It is needed in our post-grunge world." -Joe Tremblay. "Steve Scott is a rare individual who combines a deep love and understanding of Scripture with a passion for the arts." -Steve Turner, author of The Gospel According to the Beatles. "A uniquely gifted musical poet? One thing you cannot do with Steve Scott is categorise him." 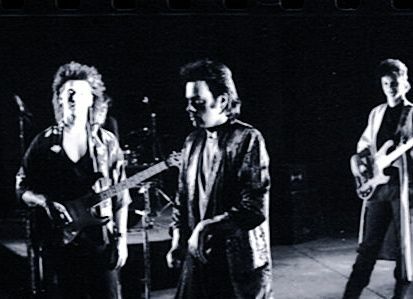 -Peter Banks, keyboardist for British rock band After the Fire , known for "Der Kommissar", "Laser Love""One Rule For You", "Wild West Show" and numerous other songs. "Steve Scott links a number of fields of inquiry that are usually perceived as unrelated. In doing so he hopes to open wider possibilities for Christians in the arts, who may perhaps be relieved to find that in many ways they were right all along." -Rupert Loydell, author of The Museum of Light. For arts, book and Bible study groups: Save on quantity orders direct from the publisher, Author House (Click for Bookstore and search for title). Or order from your favorite bookstore. When it first appeared in Britain some fifteen years ago, Crying for a Vision was met with sighs of relief: "At last an book about art by a working artist." "Steve Scott offers a challenge to artists and a manifesto for the arts." Are You Responsible for This Monstrosity? How Can You Use Something That Leaks? (Wipf and Stock edition shown). "Like a House on Fire gives fresh light and insight into how not to retreat into the margins of postmodern analysis. This book is a wake-up call to the Church and will shake the arts world to its foundational roots." -Nigel Goodwin, Genesis Arts Trust. "Steve Scott guides the artist into stepping outside the religious ghettos of safe art." "Timely and thought- provoking, Like a House on Fire inspires us to abandon our ethnocentric worldviews and embrace the arts as a bridge to other cultures." -Dr. Colin Harbinson, International Dean, College of the Arts, University of the Nations. In the wake of Western culture's postmodern shift, is it possible to express ultimate truth, or declare absolutes of value? for the renewal of culture and the individual. Published by Cornerstone Press, 1997. Reprinted by Wipf and Stock. What is Truth (in Art)? Coda: Am I Really Here or Is It Only Art? "It Was Good is good, very, very good. For goodness' sake, taste its goodness for yourself." -Luci Shaw, author of The Green Earth: Poems of Creation. Read this book and love God and life more deeply. Then give a copy to all your friends." -Denis Haack, Co-director of Ransom Fellowship. It Was Good: Making Art to the Glory of God builds on the foundation laid in other books that have explored the validity of a Christian's calling to, and involvement in, the arts. This collection of essays takes the next step in discussing the artist's calling. Published bySquare Halo Books, 2007. 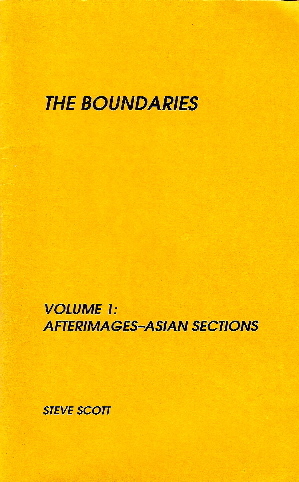 Previous edition published 2000. Includes "Truth" by Steve Scott. 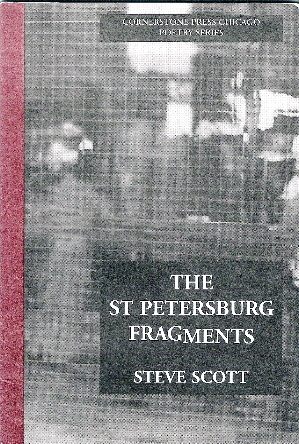 55 page chapbook of poetry and continuing travel journals. Copyright 1990 Steve Scott. Church Calcutta India: Flight from SF/Frankfurt/Bombay Leela Penta Hotel The Tour Delhi Hare Krishna (London/ Avignon/ Los Angeles) The Present. Shopping in DelhiAfternoon Tour Agra Madras Trivandrum Mayday Bus/Train to Ramaswaram Bombay Again Calcutta Bread and Puppet (London/New York)Last Day in India Departure Calcutta. Delhi. Frankfurt. San Francisco. Last Day in Bali Bali/Java: Flight SF/Bali Beach Hotel Denpasar Dyana Pura Tuesday Wednesday Thursday Friday/Saturday Sunday Monday Tuesday Wayang KulitJava, Jakarta Airport Thursday Friday Saturday Back to Sarinah Department Store No Memory of You (poem) Sunday 'It's As If...' Snapshots of the Taj (poem) Dyana Pura (poem) One Hit to the Body (poem) Afterimages (poem)/ The Boundaries (poem) Beneath the Skin (poem). 26 page chapbook of poetry with introduction. Copyright 1993, 1996 Steve Scott. Cornerstone Press Poetry Series. Large size 44 page chapbook from Inertia Press. 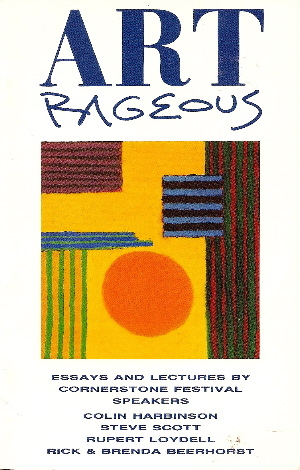 Art Rageous: Essays and Lectures By Cornerstone Festival Speakers. Seminar Notes and Essays from Cornerstone Festival 1991. By Steve Scott, Colin Harbinson, Rupert Loydell, and Rick and Brenda Beerhorst. 81 pp. 1992, Cornerstone Press, Chicago.